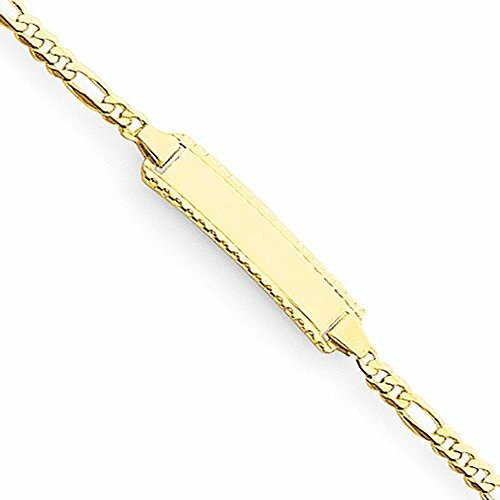 14K Yellow Gold Engravable 6mm Figaro Link Kid's ID Bracelet 6"
14K Yellow Gold Engravable 6mm Figaro Link Kid's ID Bracelet 6" . Features: Polished - 14k Yellow gold - Engravable - Lobster. All Colored Stones Have Been Treated to Produce and Enhance Color: Amethyst - Heat Treated || Aquamarine - Heat Treated || Citrine - Heat Treated || Emerald - Resin/Oiling || Garnet & Rhodalite Garnet - Not Enhanced || Onyx - Dyed || Opal - Impregnation/Dyed/Heat || Peridot - Not Enhanced || Pearls/Mother-of-Pearl- Bleached/Dyed/Irradiation || Pink Tourmaline - Heat Treated/Irradiated || Quartz - Heat Treated/Irradiated || Ruby - Heat Treated || Sapphire - Heat Treated || Tanzanite - Heat Treated || Topaz - Irradiated/Heat-Treated || Zircon - Heat-treated || Blue, Red & Green Diamond - Irradiated || Black, Brown & Yellow Diamond - Heat Treated/Irradiated. Disclaimer: Diamonds Not verified to have 17 facets. If you have any questions about this product by Venture Children's Collection, contact us by completing and submitting the form below. If you are looking for a specif part number, please include it with your message. Solid 14k Yellow Gold Polished Children Boy Girl Baby Kids Engravable ID Bracelet - with Secure Lobster Lock Clasp 6"
14K Yellow Gold Figaro Link 5mm Kid's ID Polished Bracelet 6"